Before October kicked off, we shared that Tria is donating a $1 from every glass of Rosé Cava Brut sold this month to Living Beyond Breast Cancer. Now, we have news that the Little Rebel Beer Garden at the Betsy Ross House and Stratus Lounge are also raising funds to donate in honor of Breast Cancer Awareness Month. On Friday, Oct. 19, the pop-up Little Rebel Beer Garden will go pink. South Philly's Devil's Den is hosting the event and pouring pink drinks from 5 to 10 p.m. There will be Yards PYNK, Free Will Saison De Rose and a sparkling rosé wine, along with a grapefruit and hibiscus cocktail. Ten percent of sales will be donated to the Rena Rowan Breast Center at the Hospital of the University of Pennsylvania. 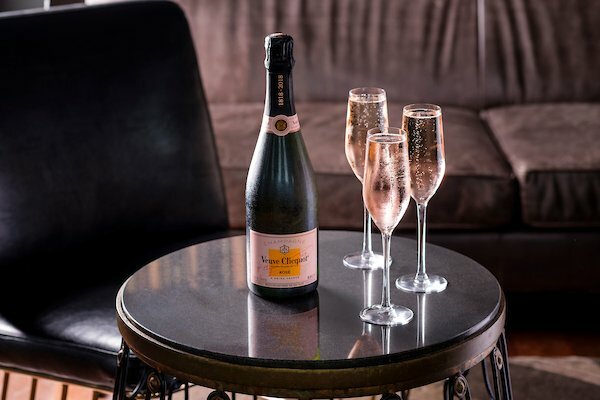 Over at Stratus, located on the roof of Hotel Monaco in Old City, glasses of Veuve Clicquot Rosé will be just $15 through Wednesday, Oct. 31. According to the bar, a glass would normally cost $50. A portion of proceeds from the sale of each glass will benefit the Linda Creed Breast Cancer Foundation, the first free-standing breast cancer nonprofit foundation in Pennsylvania.